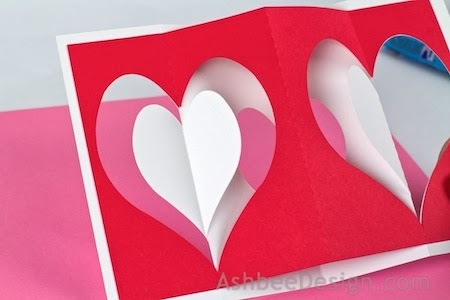 The Heart Accordion Card cutting file is available now here. 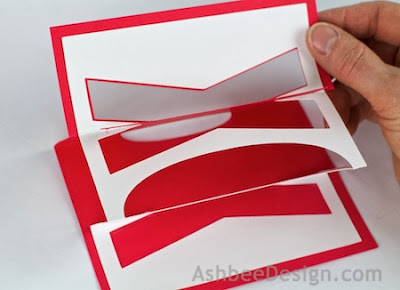 The XOX Accordion Card cutting file is here. I have modified my 2013 Christmas Card design for several Valentine applications. All are based on the same two layer accordion fold technique. 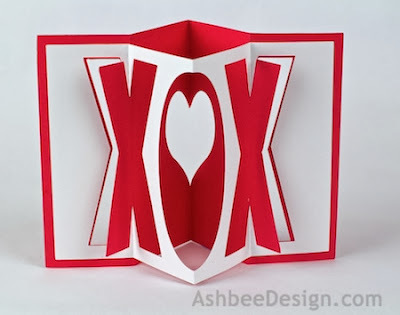 This tutorial covers both the Valentine accordion variations - the XOX and the Heart. Here are the finished designs. They are sized to fit in a standard A2 Invitation envelope. Template from Silhouette On-Line Store. 1. Download the cutting file for your Silhouette Cutting machine from the Silhouette Online Store. This is how the file is set-up. It almost completely fills 1 8.5 x 11 sheet. If working on a Portrait Silhouette you will need to copy each half to its own file and rotate it to fit it within the 8" cutting width. It does not require resizing. More detailed instructions below. 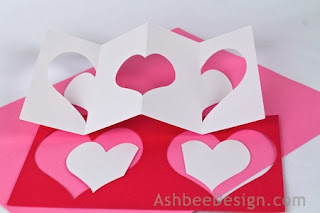 The Heart Accordion Valentine File - download here (coming soon). 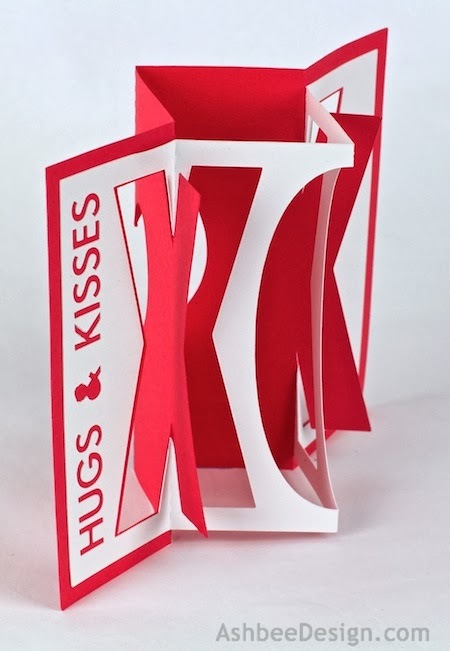 The XOXt Accordion Valentine File - download here (coming soon). For Cameo users it is set to cut. 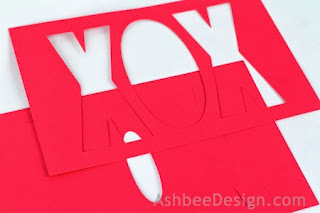 If you cut the entire file once in red card stock, and once in white, you will end up with pieces for two cards in alternating colors. 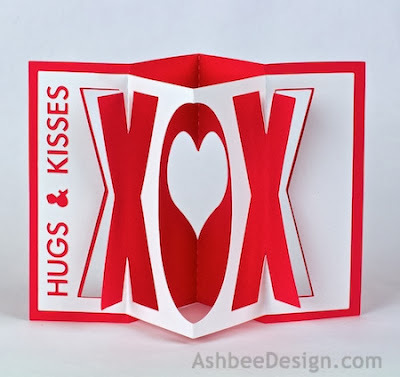 In my samples above I have cut the design both with and without the Hugs & Kisses text. One is visually simpler and quicker to cut. I like one better, my husband likes the other better. Your choice. You can leave or remove the text. To remove UNGROUP the design. Click on just the text and delete. Copy and paste each card half (Plus all enclosed parts) into a new file and rotate it 90º. 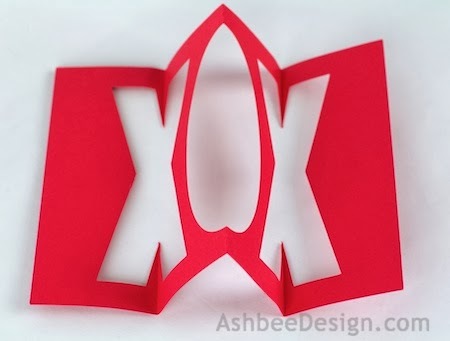 Here are the cut parts for the XOX card in all red. 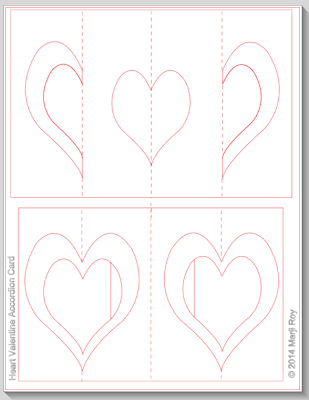 Here are the cut parts for the heart card. 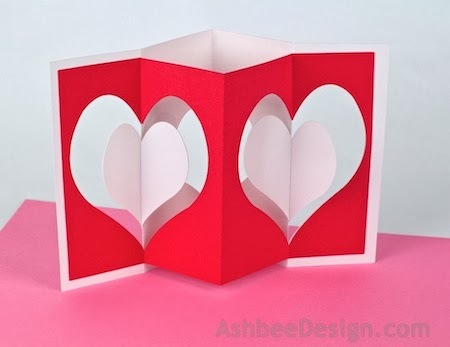 It has the two added extra hearts with a flat side. 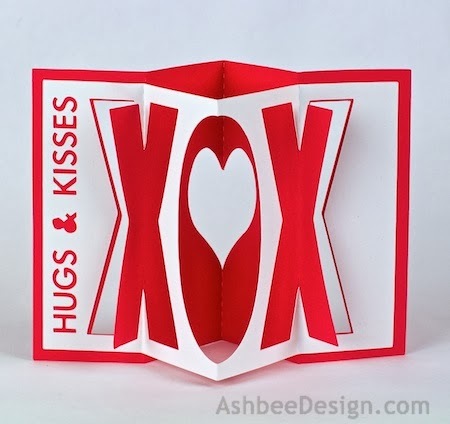 Variations of both cards can be made using a variety of papers including prints. 3. Fold the each piece as shown in the photos below. Fold along the dotted fold lines. 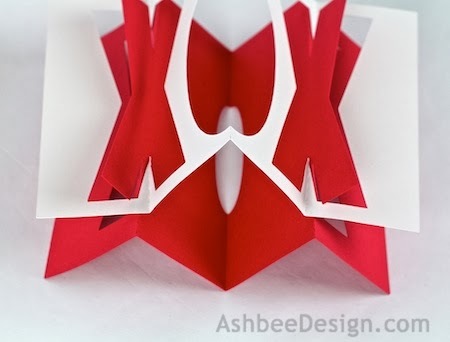 These folds are the same for both card designs. The front piece folds back on the center fold and up on the two side folds as shown. (Valley-Mountain-Valley folds). The back piece folds the opposite way, forward on the center fold and back on the two side folds as shown below. (Mountain-Valley-Mountain). It is important to remember tops and fronts. 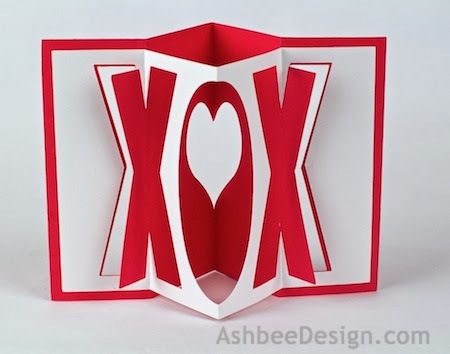 The X's of XOX are smaller on the top and the designs will not line up if you flip one around. Practice intertwining the two halves together BEFORE you apply adhesive. You want to understand how they nest together so you can accurately place them once glued. The front goes over the back. The two side designs (either X's or hearts) on the back protrude through the front layer. 4. Now glue the two layers together. I used Zig Memory Systems paper glue but others will do. Apply glue to the back of the front piece - on only one end flap at a time, and glue that in place. Placement is key. The outside corners do not line up. 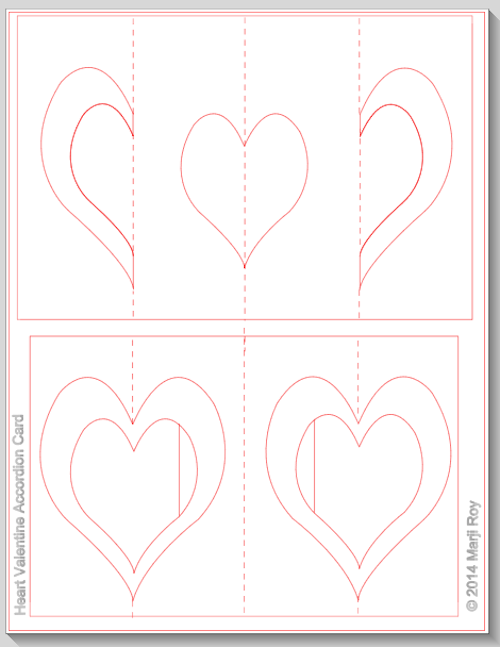 For the heart design, the hearts are the same size so just line up the left panel using the inside heart curve as a guide. On both designs, glue one end panel in place, and then glue the other end panel in place. There is no glue on the center 2 panels. 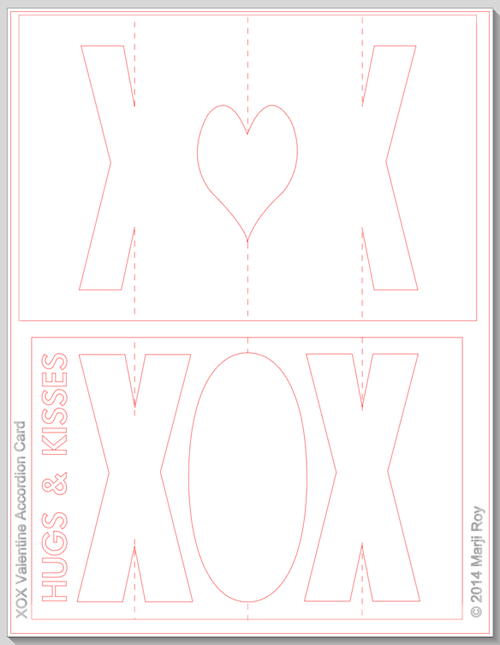 The XOX card is complete at this point but there is more to do for the heart design. Fold each of the hearts in the center forward along the dotted fold line. 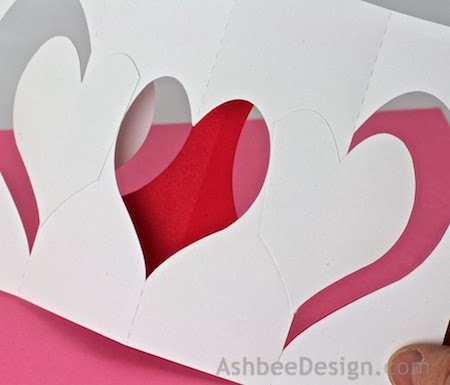 Add glue to 1/2 of the heart with the slice off the side. The glue goes on the half with the slice missing. 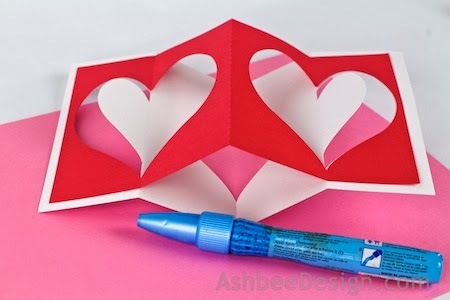 Line up the top of the heart and the bottom of the heart with the one you just folded forward and glue onto the back. 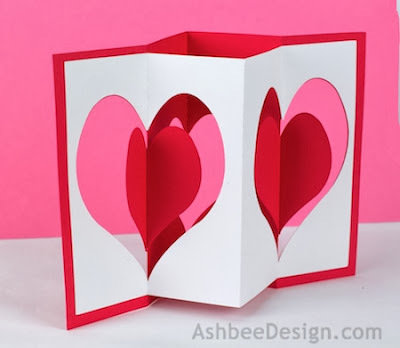 The flat edge goes toward the center so as to not show through the center heart. Repeat with the other side as well. Here is a back view with both extra hearts glued in place. 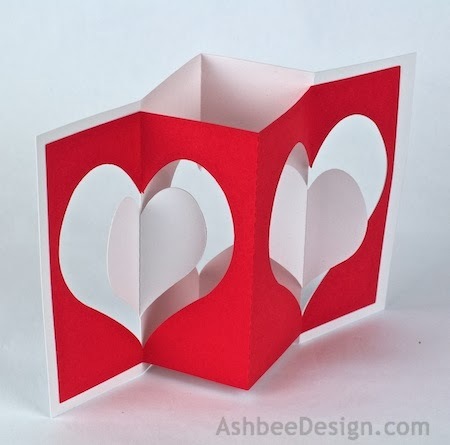 That completes the Heart Accordion card. If you cut the designs twice on the Cameo you will now have a second set to assemble another card in an alternating color scheme. Then decide who to send them to! Yes, I added the border because I like the visual offset with the border of white. It does upset the balance if you want to display the card. 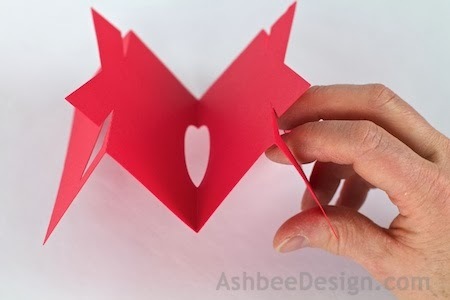 I'd fold a little triangle of white card stock and put it under the front point. Or I used a little blue painters tape to hold mine in place. Then it stays when the wind blows, as well as stands on display. Welcome to the blog. I try to add something new every week. I skip around with different ideas and projects but do a lot with 3D. That is pretty creative and clever Valentines day greetings. Love the tutorial too. Cheers! Hi.. I am wondering if you have a picture of what these look like folded? I can't seem to visualize it. Beautiful cards! I went back through my photos and I am sorry but no, I don't have a photo of it closed. 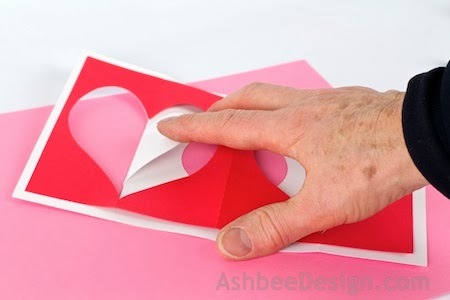 But it does fit in an Invitation envelope so The image in step 4 shows the beginning of it being folded.